I have installed thunderbird and thunderbird-locale-es but the interface shows some literals in english (see screenshot). I was wondering if these are the only strings in English you see? 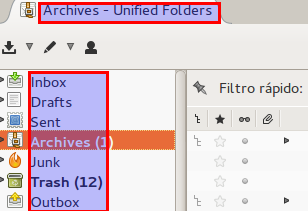 I think these may be the actual names of the folders in the mail server, and the app is only reflecting that. Anyway, this bug should be forwarded to the relevant Mozilla l10n team, as the Ubuntu translators don't manage Thunderbird's translations. No, it's a bug of spanish ubuntu package. 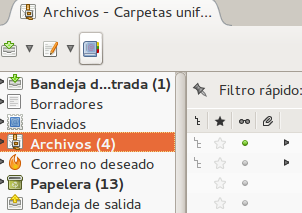 I have download spanish Thunderbird from FTP Mozilla and it shows all in spanish: see screenshot. Thank you for submitting this bug and reporting a problem with spanish translations in Thunderbird. You made this bug report in 2013 and there have been several versions of Ubuntu and Thunderbird since then.